Ernesto Rivas stands at right in this photo also showing R.D. “Erp” Erpelding and a village kid we called Dum Dum. The little boy’s mother was dead and his father either working or drunk, so Dum Dum spent most of the daylight hours hanging around the Marines. We considered him a sort of mascot, gave him C-rations and bought him treats. Marines used to write home to their mothers to send clothes and toys for Dum Dum and the other kids of the ville. 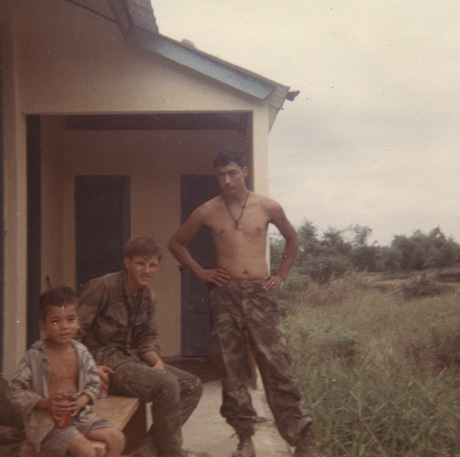 This photo was taken early in 1970, maybe April or May, behind the unused clinic near the Thanh Quit village market.